8 1/2 by 12 3/8 in. Béraud is not only a perfect Parisian, but he is one who appreciates and can depict Parisian life on its boulevards, cafés, and gardens. He paints his pictures in the open air, as we have said, using a cab [carriage] for his studio, which can be moved to any point he wishes. (Henry Bacon, Parisian Art and Artists, Boston, 1883, pp. 126-7). There is in his paintings a double extract of Parisianism. I do not know another person, among the modern artists, who is more modern than he . . . I will counsel [collectors] to collect precisely Béraud’s pretty canvases, without which it would be very difficult to accurately write the history of our time (Louis Énault, "Le Vertige," Paris-Salon 1882, Paris, 1882, n.p.). By the middle of the 1880s, Jean Béraud had already established himself as the leading chronicler of the city of Paris and among the most famous and desirable artists of the Belle Époque. “[E]very one, every gallery, wants and needs a Béraud,” confirmed the New York Times in 1891, “This means a street scene . . .”. [i] Béraud’s images of the urban landscape around him, drastically altered with the restructuring campaigns of a few decades before, offered to contemporaries a vision they found both startlingly original and impossible to resist – an honest portrayal of their glittering, gritty, thoroughly modern city lives. The present picture, a sunlit view across Paris’s Champs-Élysées, is one of Béraud’s most intimate records of this iconic thoroughfare, and demonstrates the intensely personal nature of even his most frequently depicted metropolitan scenes. 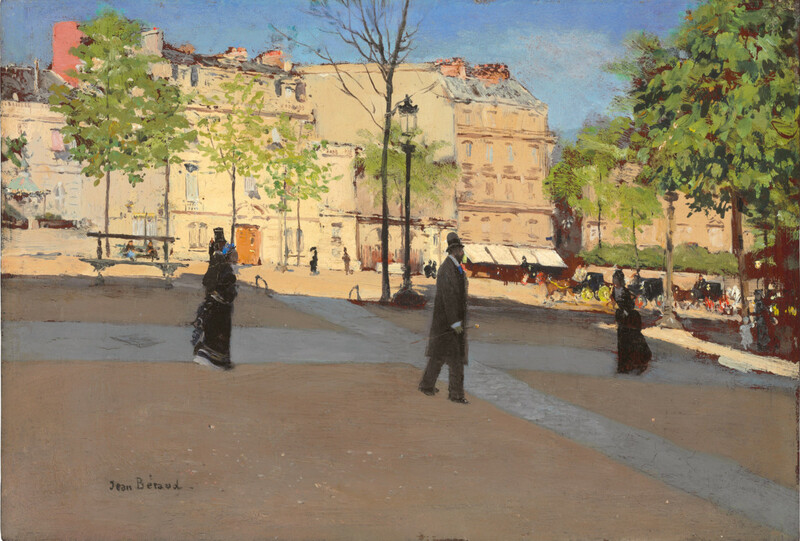 The spontaneity of Béraud’s brushwork in Place ensoleillée and his intense interest in the play of light and shadow across the buildings, trees, and open walkways reflects both the friendships that he had made and the prevailing artistic movements in France at the end of the nineteenth century. A close friend of Manet (1832-1883), Béraud also looked to Degas (1834-1917) as a mentor, and frequented the same cafés, restaurants, and theaters as Renoir (1841-1919), Toulouse-Lautrec (1864-1901) and other leading artists of the day. Elements of their styles are evident in certain passages of Béraud’s art, but there is never a direct quotation. Rather, Béraud selects threads of their Impressionist approaches and pairs them with the details and neutrality of Realism’s gaze, in order to create a unified and profoundly original vision of modern urban life. Here, for example, underneath the animated surface and with the slightest flick of his brush, Béraud is able to ground his picture in the concrete realities of the Champs-Élysées, producing a carriage, a mother with her child, a man in a top hat, and a woman in the latest, bustled dress. “[Jean Béraud is a] modern master,” wrote one contemporary just a few years before this work was made, “[. . .] who paints neither the old that exists no longer nor the future which does not yet exist, but only the reality of today, and who sees life only in the present hour and the moment now passing – and who seizes it [. . .].”[viii] In its combination of atmosphere and substance, the fleeting and the fixed, the brilliance of Béraud’s picture is clear: honest, evocative, and inimitable, it is as modern as it is enduring. This note was written by Emily M. Weeks, Ph.D.
[i] “Art at the Champ de Mars,” New York Times, December 21, 1891. [ii] During the process of Paris’s “Haussmannization,” hundreds of miles of small narrow streets, especially in the city center, were altered to make way for 85 miles of wide, tree-lined avenues and boulevards. [iii] For more on this subject, particularly as it appeared in French art and literature of the 1860s and ‘70s, see Nancy Forgione, “Everyday Life in Motion: The Art of Walking in Late Nineteenth-Century Paris,” The Art Bulletin, vol. 87, no. 4, December 2005, pp. 664-87. [iv] E. de Saulnat et A.P. Martial, eds., Les Boulevards de Paris, Paris, 1877, pp. viii-ix. [v] “No classicism for Jean Béraud,” wrote one critic of the artist’s near obsession, “Give him the Boulevard and you may keep the Coliseum,” (Ishmael, “French Painters ‘Chez Eux’,” The Illustrated American, vol. 3, September 20, 1890, p. 547). Béraud was not alone in his artistic focus: as people were forced to renegotiate their relationship with the city in the wake of Baron Haussmann’s programs, the Parisian street became a major theme among late nineteenth-century artists. The works of Gustave Caillebotte (1848-1894), who studied with Béraud under Léon Bonnat (1833-1922) in the 1870s, provide a particularly compelling point of comparison with Béraud’s own. [vi] At various times, Béraud maintained a studio on the rue Washington, near the Champs-Élysées, and one near Montmartre, as well. The spartan nature of these workspaces was remarked upon by several contemporaries: “[Béraud] disdains draperies and bric-à-brac. His studio is a room like a thousand other rooms you may see in Paris, hung with red stuff, plainly furnished with a few chairs, desks, looking-glasses, and studies for the dainty pictures which fetch such high prices when they are exhibited in the Salon, or in the galleries of the Volney and the Mirlitons,” (Ishmael, “French Painters ‘Chez Eux’,” The Illustrated American, vol. 3, September 20, 1890, pp. 547-8). [vii] A similar experience was recounted by the journalist Paul Hourie: “[. . .] Jean Béraud has the strangest life imaginable. He spends all of his time in carriages. It is not unusual to see a cab parked on a corner of a street for hours on end, with an artist sitting inside, firing off rapid sketches. That’s Jean Béraud in search of a scene, drawing a small fragment of Paris. Almost all the cab drivers in the city know him. He’s one of their favorite passengers, because he at least does not wear their horses out,” (Paul Hourie, “Jean Béraud,” L’Estafette, September 13, 1880, quoted in Patrick Offtenstadt, Jean Béraud 1849-1935, The Belle Epoque, A Dream of Times Gone By, Catalogue Raisonné, Köln, 1999, p. 9). When Place ensoleillée was exhibited in New York in 1939 – testament to the high regard with which even the slightest of Béraud’s sketches were held - it was accompanied by two far more detailed paintings, Parisian Avenue (no. 17) and Rue Royale (no. 15). Béraud’s small work would have provided an informative counterpoint to this pair, offering insight into his unique artistic process. [viii] Louis Énault, “Jean Béraud: La Salle des Filles au Dépôt,” Paris-Salon 1886, vol. 1, Paris, 1886, pp. 11-12.